Good morning to all. Well, we can almost scratch April 2016 off the calendar. Before we know it Christmas will be here, but before that I am sure that the 100 degree weather is just around the corner – YEA (not really). We are in the process of remodeling our kitchen and bathrooms and are almost through (I say “we” but O’Krent and Clay have done all the work), but what a messy month with this project. Nothing is in its’ place, and time to sit down and really finish something, or work on a quilt project is out the window. In fact, again, I am in a holding pattern! I am really looking forward to 1 May – my house cleaner will be here to take care of that and maybe the 2nd bath will be complete and we can start the month of May having fun – at least I hope it goes that way. I could have skipped all the “fun” I had this past week, and Clay surly could have been having more fun working on his hobbies than doing what he did. But I digress again…. This is time for CWB updates. Today I am going to post Lynn’s Block 1 and 2 today and re-post Cathy’s, Jaydee’s and my Block 1 along with our completed Block 2. Cathy and I are playing the “catchup” game with this project. My hands (CTS) sometimes just do not want to applique anymore. 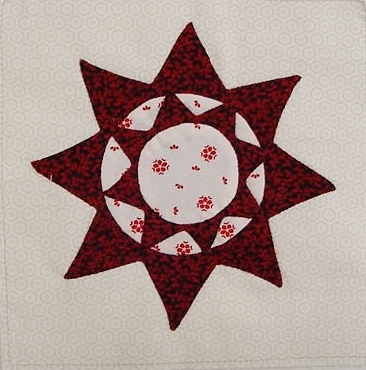 I am in the mood to just do some “easy” piecing and getting some quilt tops put together and of course, quilt the darn quilts that are screaming at me! Oh well. 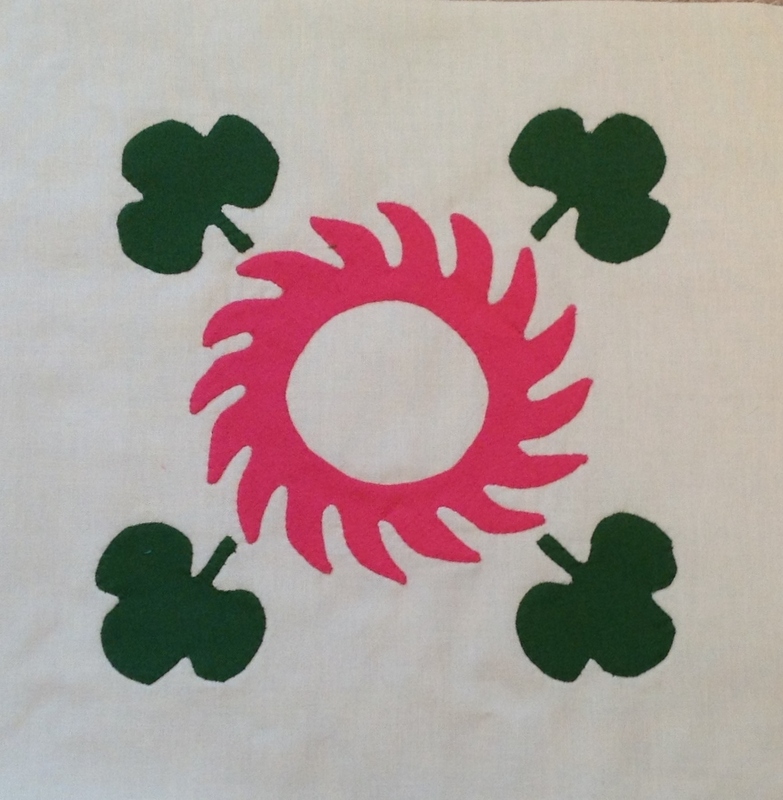 Lynn is doing machine applique (smart lady – saves the hands – but I do not do machine applique) and is using the Lost Boy quilt pattern. She is miles ahead of Cathy and I but that is OK we have not clock to watch. 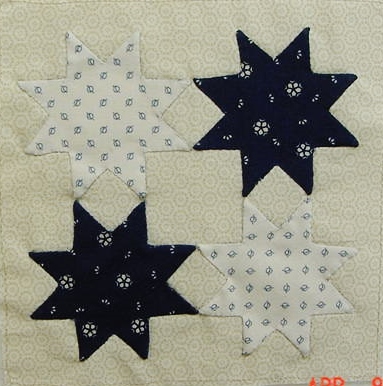 Our original goal was to post 2 blocks a month, but when it takes 30 hours plus to needle turn one block,and about 10 hours in fabric selection and preparation of the pieces, this tends to take up a lot of time, so we will be posting our progress as we finish our blocks. I am trying to post the same block for all of us at the same time so it will be easier to compare the differences in the blocks. Lynn is also modifying the pattern as she goes. 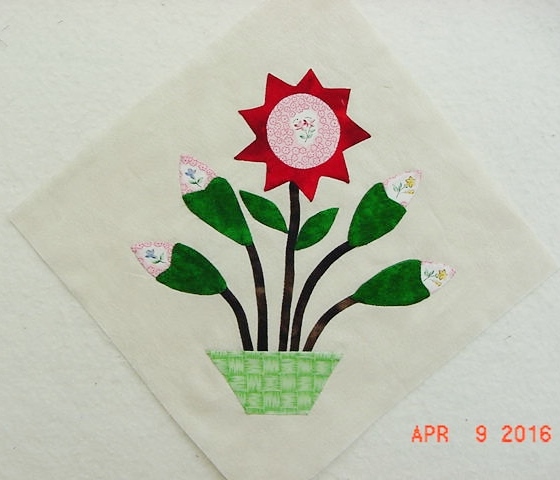 She is using reproduction fabrics and machine applique. Lynn also changed the birds from the original pattern. The bunny rabbits in the vase are quite different and she added Lady Bugs on the leaves! Good idea. 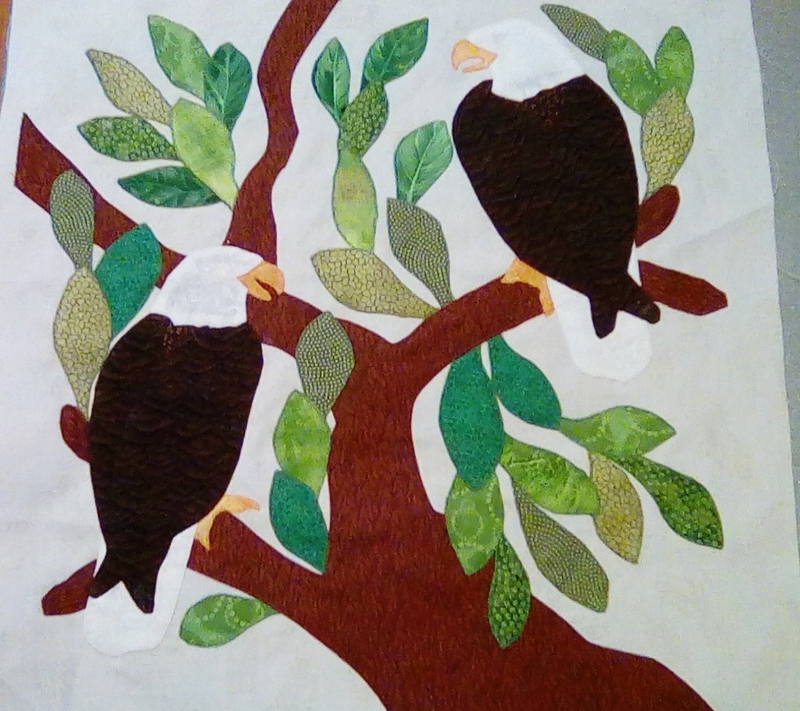 Lynn changed the stems in the original pattern to a tree and re-drew the “buzzard birds” to Eagles. Nice work. 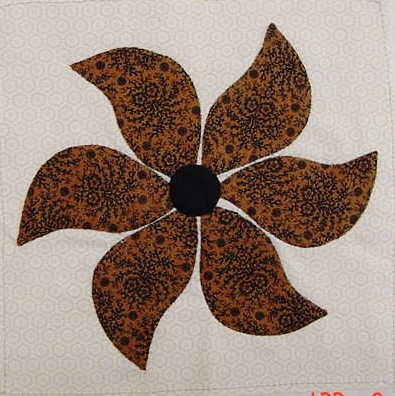 For Block 2 Cathy has used ultra suede for the bird’s feet and the eyes are part of the black paisley found on the brown. Neat feet! She is using reproduction fabrics. 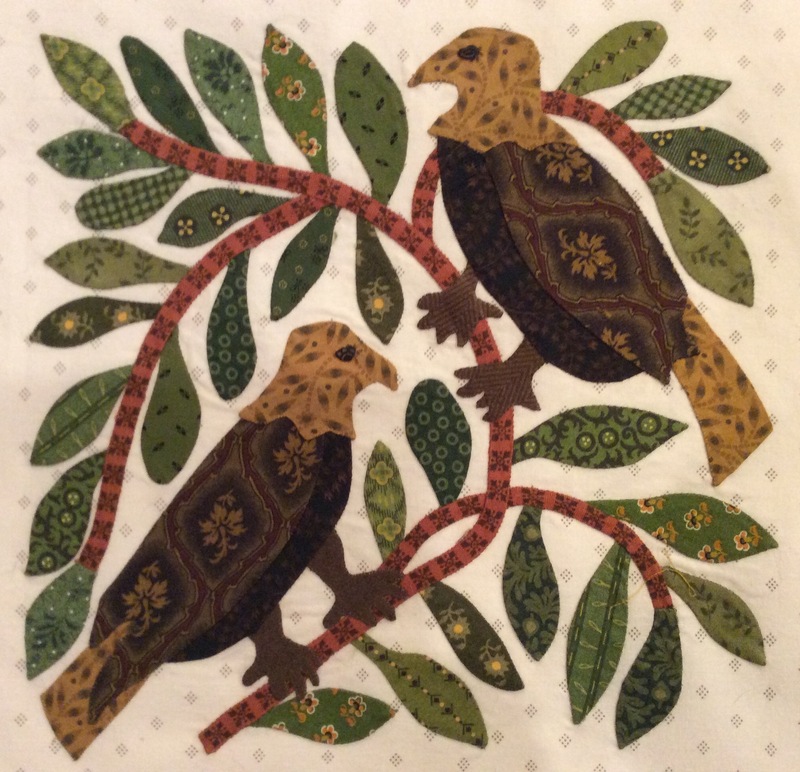 Cathy also changed her “buzzard birds” and did some fussy cutting! 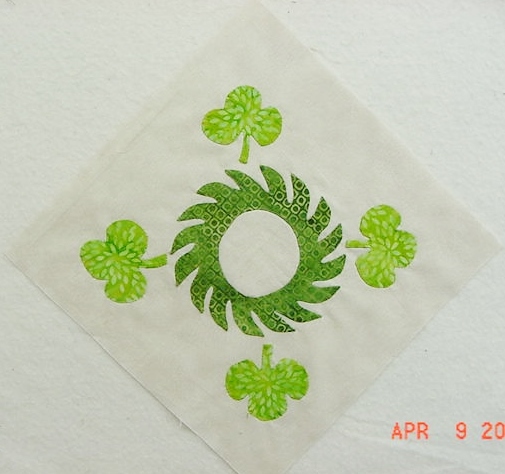 She also used a different fabric for each leaf for a very different look. 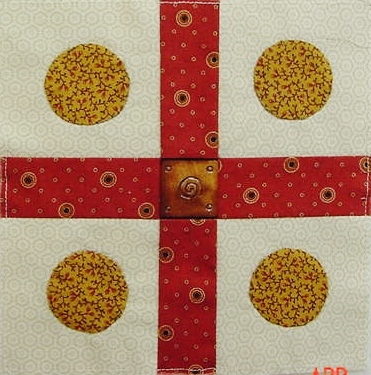 I am doing my quilt in Batiks, so mine definitely has a different look. I did not like the “original” birds, so I added Humming Birds. 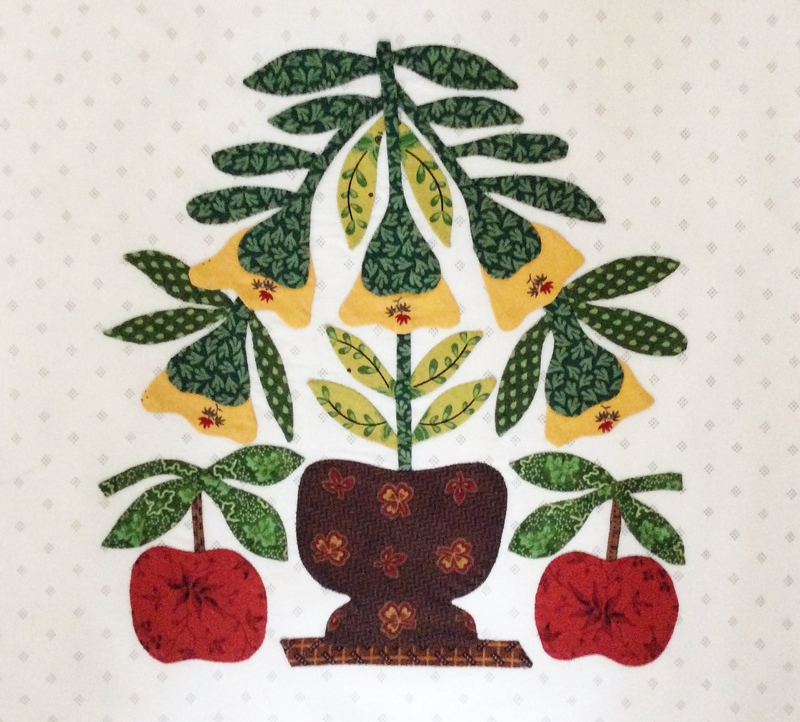 I am following A Bountiful Life quilt pattern. I totally wiped the buzzard’s and/or eagles off the block and chose to do Blue Birds. 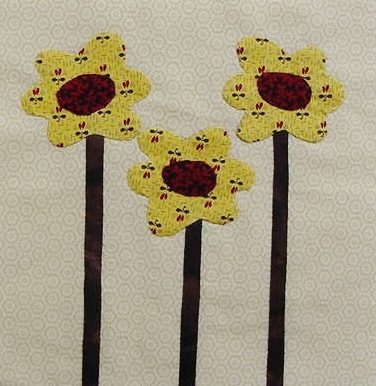 I do not think they will have feet on the stems as I like to think of them just lighting on the branches. I may get some suede from Cathy do redo the eyes as it is hard to see them with the embroidery thread and the dark fabric I used for the heads. 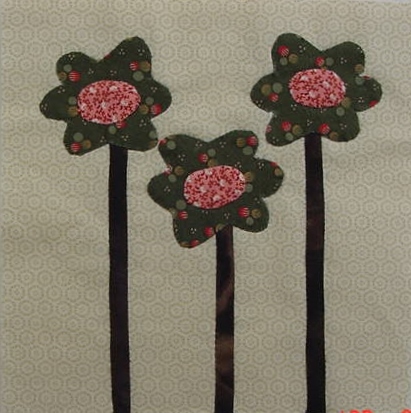 The background fabric did not come out the true color that is in Block 2. 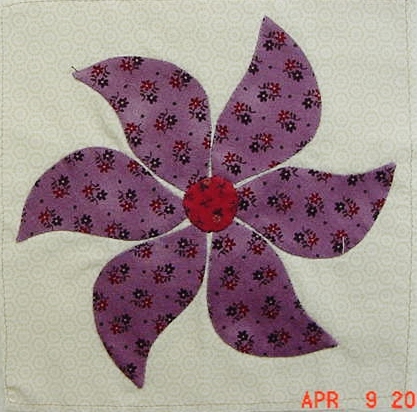 I am using Michael Miller Krystal fabric and it is the accurate color in my Block one. I guess the lighting makes all the difference in the world when taking the pictures! Here is Jaydee’s Block 1. 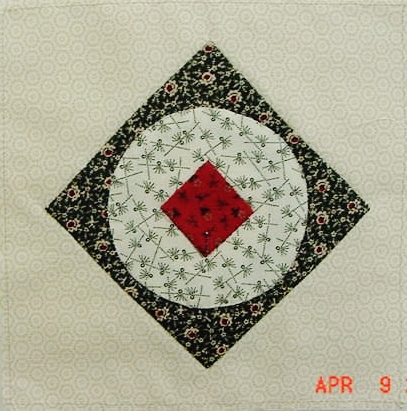 She has been working on this project before we decided to start the QAL and she is using the Australian quilt pattern Civil War Bride. She is also using Reproduction fabrics. The blocks that she has already completed are set different in her pattern, so she is realigning her block numbers to coincide with ours and working on Block 2. She calls that block the “pink” bird blocks. No hurry as I am on my tricycle trying to just get to Block 3! 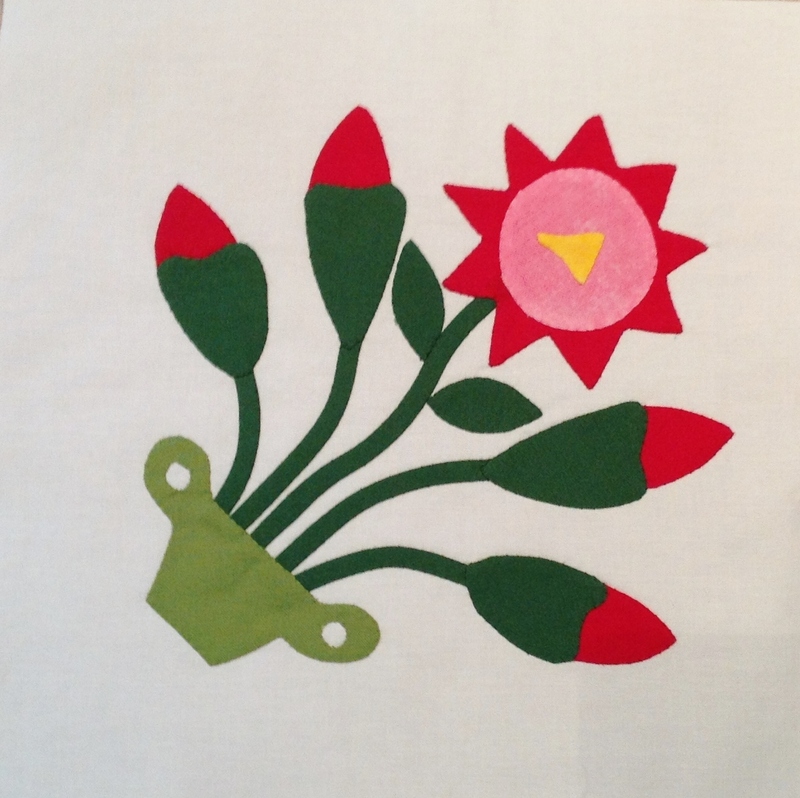 I have decided that my nighttime fun will be A Bountiful Life of Applique. 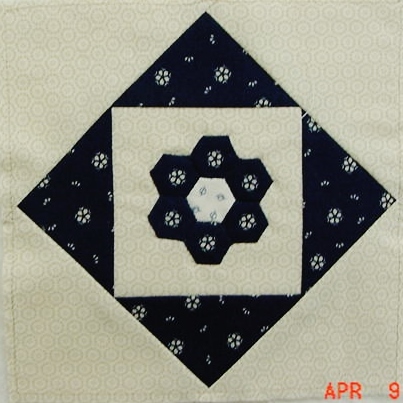 Daytime is going to be Dear Jane and maybe Brinton Hall placement of hexagons. Whichever, I had better hurry up if I am going to have anything finished by the end of the year – maybe my choice of doing different quilts at the same time was not to smart – time will tell! 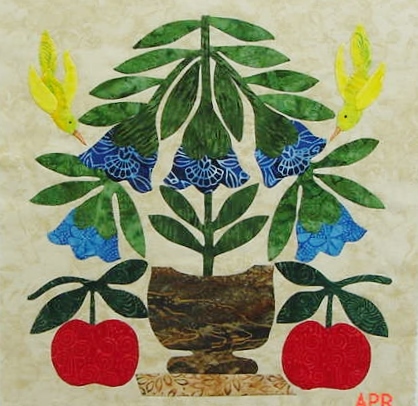 Well, hope you have enjoyed revisiting our progress of CWB, Lost Boy Quilt, and A Bountiful Life, and from now on I will be posting each series of blocks as we have completed. Have a wonderful Sunday and hopefully a safe and sound and happy sewing week! Changing My Mind – Again! Tomorrow Clay and I are going to journey to Belton, Texas for the bi-annual Ham Fest for Amateur Radio Operators. A Ham Fest is like a Quilt Show to Quilters! I have always enjoyed going with Clay – fun to talk to the guys and to look at the equipment they bring to sell and the newest radios on the market. 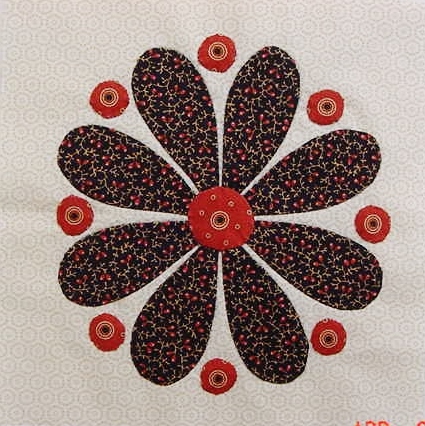 There is a neat quilt shop called The Sewing Basket, located in Salado, Texas and YES I will be visiting them. In the meantime, I wanted to update a Block Change. When I work on a project, as I finish each block I put them on my design board to study. 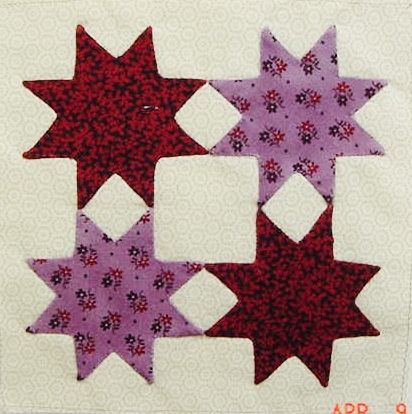 I put the 4 blocks from the Margaret Potts quilt on the design board and my eyes kept coming back to Block 11. It just did not “pop” and I knew that it was the “pink fussy cut” flowers that did not blend with the large flower. I knew then I needed to go back to the original rose petals that I had cut out for Block 11. I think this looks much better than the first version. I will be a little more selective next time. 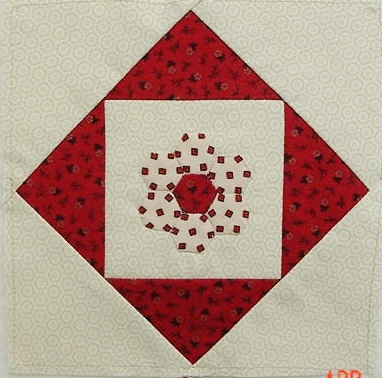 I am sure that when we Quilters do not feel good that it impacts our fabric selection – especially with Applique. Have a wonderful week-end. I am going to take my CWB along just in case it gets “boring”. I am behind on CWB and need to catch up. Life is good! 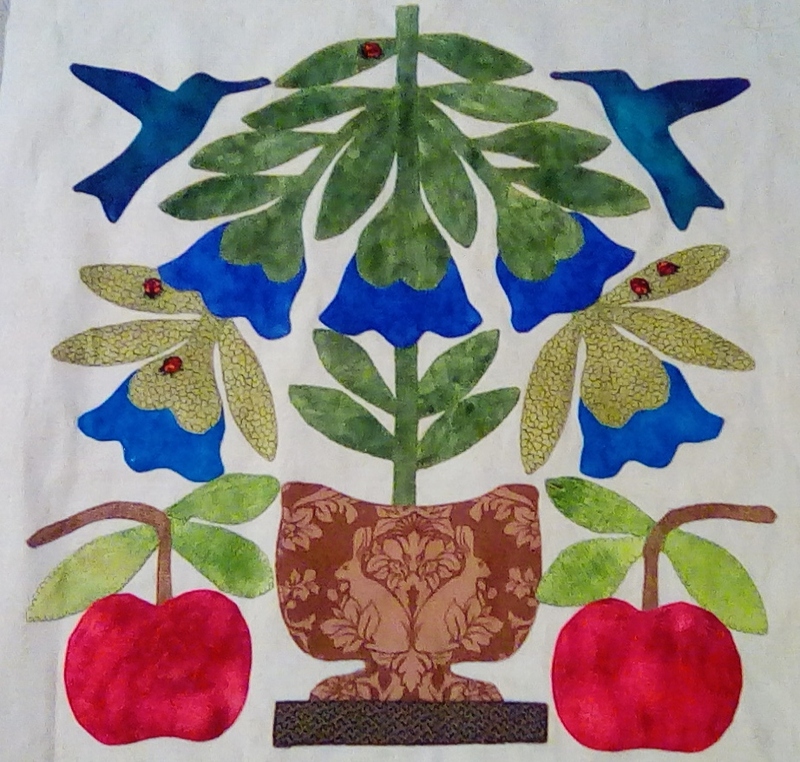 This morning I received a picture of Cathy’s finished Block 1 with Butterflies. I really like the Butterflies – especially better than the original “birds”. Update on the RF treatment – things are looking like I am back to normal – YEA! I just did not realize how bad I was hurting. Let’s do more of this more often Dr Growney! 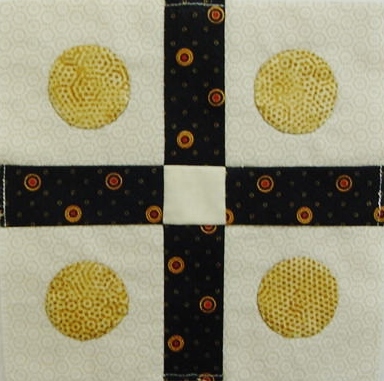 I usually do not blog personal feelings, experiences, etc, but this morning I was looking back at the year 2014 before Clay’s son was diagnosed with terminal cancer and where I was in my quilting journey. It was on 22 April 2014 on his 50th Birthday. And here we are 2 years from that horrible day when we found out about Darryl, and I have been wondering – “why do I have this feeling that I have lost 2 years of my life”? Why am I so behind on the projects that I wanted to do in 2014? 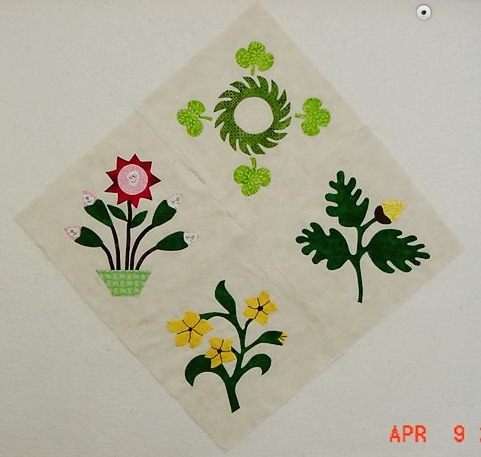 It was at a time when I had started my Blog, learned about Australian quilts (like Di Ford’s Mystery Quilt), and buying all those beautiful Reproduction fabrics and patterns, when our lives stopped in time. 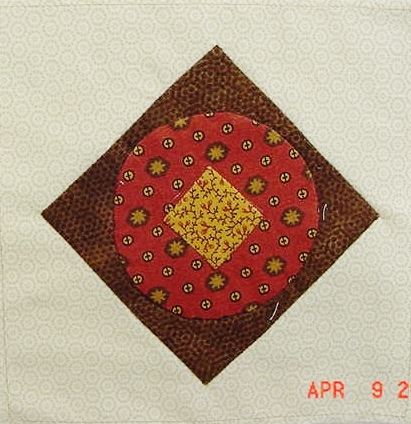 Before this happened, Life was good, I was happy and excited about taking on highly technical and challenging quilts to enter into Quilt Shows. It has been difficult for me to find that “spot” again, but I do believe it is coming back to me. I realized it this morning when I scrolled back to my 2014 Blog Postings. Ah, the memories of where I was then and where I am today. It has inspired me to realize that I need to “get with the program” and go forward – as fast as I can. I have learned that anytime one goes through this type of situation, life changes all around you, and when it is over with one has to deal with “getting over the horrible emotional time”. For the first time in 2 years, I feel like I am coming back. Energy level is going to be so much better, mood will be more like I was before that date in April 2014. I had experienced something similar to this when I had to become Legal Guardian for my Mother from 1986 through 1996 when she had Alzheimer’s. She was in a nursing home and I had a full-time position with the Government. No one even knew how to spell the word, much less what it was and how devastating it can be on the person who has it and the family. Of course I was still in my 40’s and maybe I was able to handle the stress of her illness, my position at work, raising two-step sons, finishing my college degree, and ending all with a divorce much better then. When she passed the one thing I remember was that I wanted to retire and quit working. I had a difficult time trying to figure that one out. I think it was the grieving process that we all go through when we lose a loved one. As we age, stress is more difficult to handle and especially if it is a family illness that takes a loved one away. But we who are left to continue on with our lives must continue to work through the sadness and learn to appreciate and love life again. I feel that I am on that positive road again, especially with the help of my dear Dr Growney and Dr Neidre who have helped me through 4 back surgeries and now watching over me with post operative sciatica. How Blessed I am to have wonderful Doctors to care for me! Of course, none of my happiness would be possible without the love of my husband Clay who has never left my side in 20 years, and my dear friends, Jaydee, Cathy, and Wanda who always support me when I am need a friend! 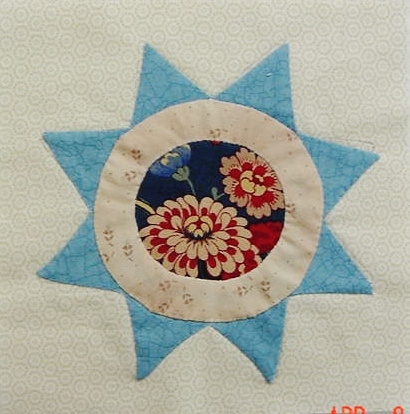 Thank you for listening as it is rare for me to post anything but quilting on my Blog. Have a blessed day and Live and Love your Life! Always!!! Well, this year is going to just fly by! We are almost half-way through the month of April! We are having nice Spring weather and maybe it will be this way through May – would be nice. Yesterday I had the Radio Frequency treatments in the back. Technology has come a long way for those with post back surgeries, etc. It will take a few more days, but I am motivating and the leg pain is gone – of course when you kill the nerves the brain just doesn’t feel a thing! LOL. Bird of Paradise Quilt Civil War Bride (Australian Version) Lost Boy Quilt (Barbara Korengold) (Scroll down to Quilt Number 4) and A Bountiful Life by Karen Mowery who passed away in 2013 from Breast Cancer and Folk Art in NYC Patricia Cox’s adaptation of the original quilt. 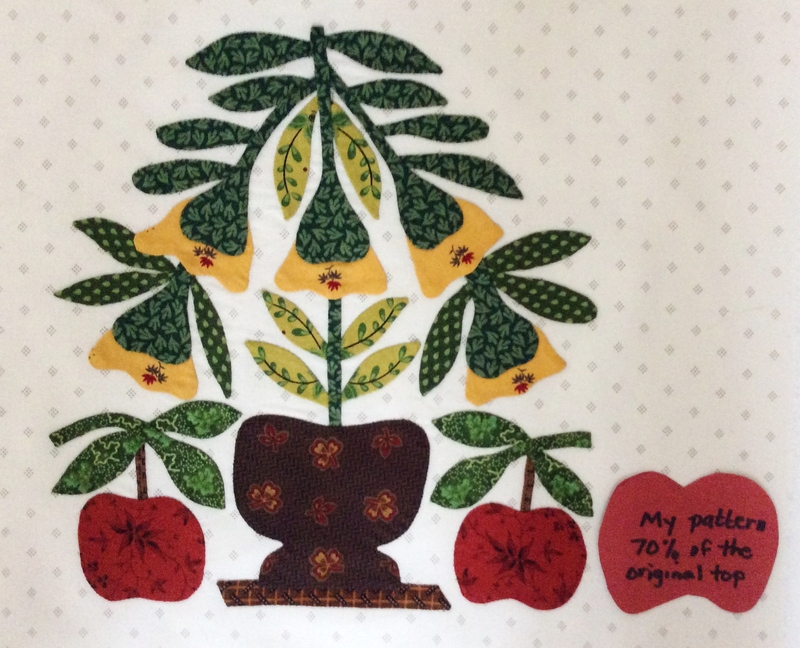 I am using the pattern A Bountiful Life along with changes by using bird patterns from Patricia Cox’s adaptation Folk Art NYC. 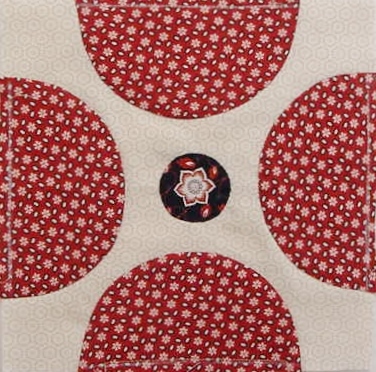 My blocks will be 14″ x 14″ finished and I am using all Batiks for my quilt. I did not care for the “birds” in the original designs so I added Hummingbirds. The beaks are embroidered. 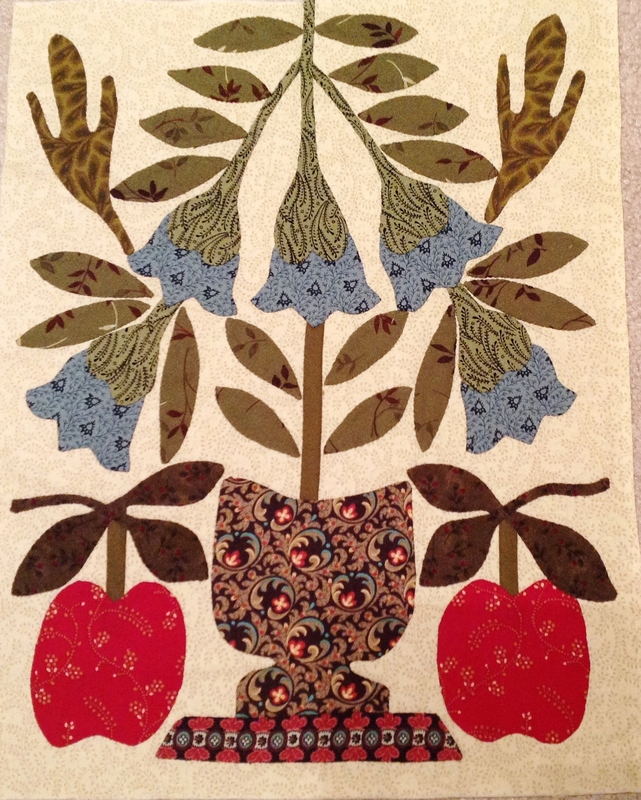 Cathy is using the pattern Lost Boy Quilt and decided to reduce the blocks to 10″ x 10″ finished. (Brave Lady)! You can see the difference it makes by reducing the pattern in her 2nd picture where she placed the original size apple next to her apple in her block for comparison. 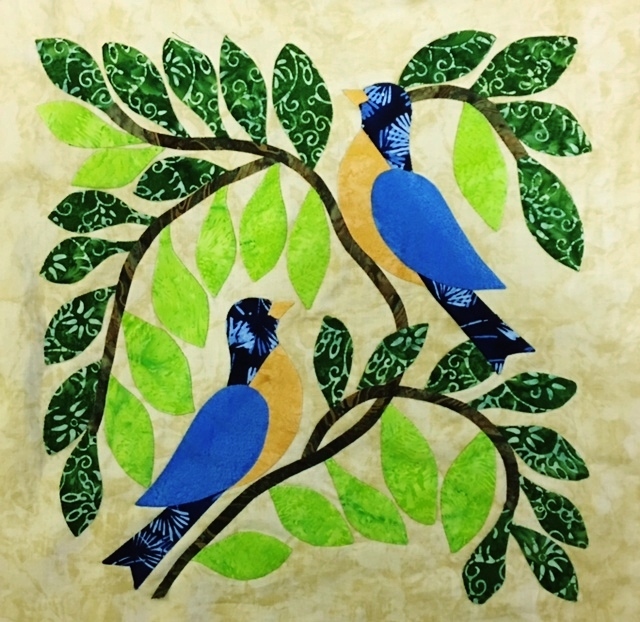 She is using Reproduction Fabrics and has not decided on which birds she will add to on the top 2 corners. 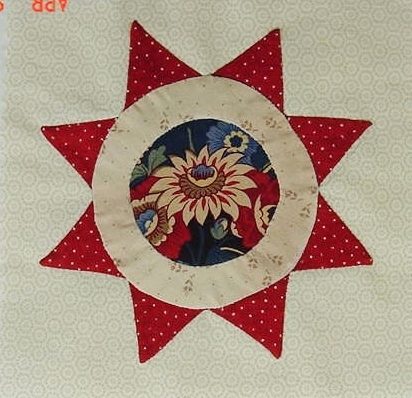 Jaydee is using the Australian version of Civil War Bride and had already started making the quilt before Cathy and I even dreamed of making this quilt. The Blocks are 11″ x 14″. She is definitely ahead of the game, but as we progress we will showcase her blocks along with ours. Heck – we may even catch up with her someday. LOL. This is going to be a fun project, and very interesting as to how the different blocks turn out. As we work on the preparation of each block, each of us are adding/changing the pattern to personal preferences. This is what makes working on a quilt as detailed and technical so challenging and exciting. 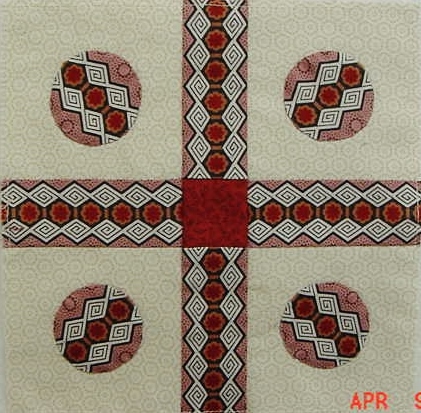 After all, it will end up each Quilter’s own personal quilt! PS. I do not have Lynn’s full size pictures to post but as soon as I receive them I will update the post. Stonefield’s Segment 2 and 3 – COMPLETED! Hello again! Well as you can see I have been busy. I find that if I do not sit at the computer early in the AM drinking my coffee that I do have a little more time to quilt. BUT then there is the catch-up time involved, so one wonders – maybe coffee and checking Blogs and emails early in the AM is better – Decisions Decisions Decisions! Here are pictures of Segment’s 2 and 3 that are completed. I am really enjoying this project too. But I think I will take a break from Stonefield’s until May. We will be going to Oklahoma for a Casino run in June and I will take Segment 4 and of course my CWB blocks along for the ride. OK – Now that I have fought again with WordPress and pictures, I got their number – I have to Center all of the pictures.. Go figure! My Version of Date Night – The original was not for me! During the last month, we decided that it was time for some changes in the house! New kitchen and bathroom flooring, new vanities, some touch up painting on the ceiling in the half-bath, and of course some new furniture. All should be in place by the end of the month – YEA. We wanted to contract the work out but could not find a good contractor, with the exception of O’Krent Flooring in San Antonio – whom I have dealt with since the ’70’s. They will be doing the flooring for us. Clay is being Clay the Builder again changing out the vanities and other small projects. ME – I have been spending money like crazy – better for us than leaving it for someone else to enjoy! Take care and tomorrow I will be Blogging the progress on the Civil War Bride project with Cathy, Lynn, and Jaydee! Stay tuned! I am now 2/3’s caught up on my posting! I have also upgraded my WordPress account – I will be updating the site later during the month. I am going to get some relief on the Sciatica this Monday – YEA! So hopefully I will have the time and energy and of course some semblance of a brain to change the look of my Blog. Ready or not – Spring is here and in South Texas I think a hot summer is right around the corner! 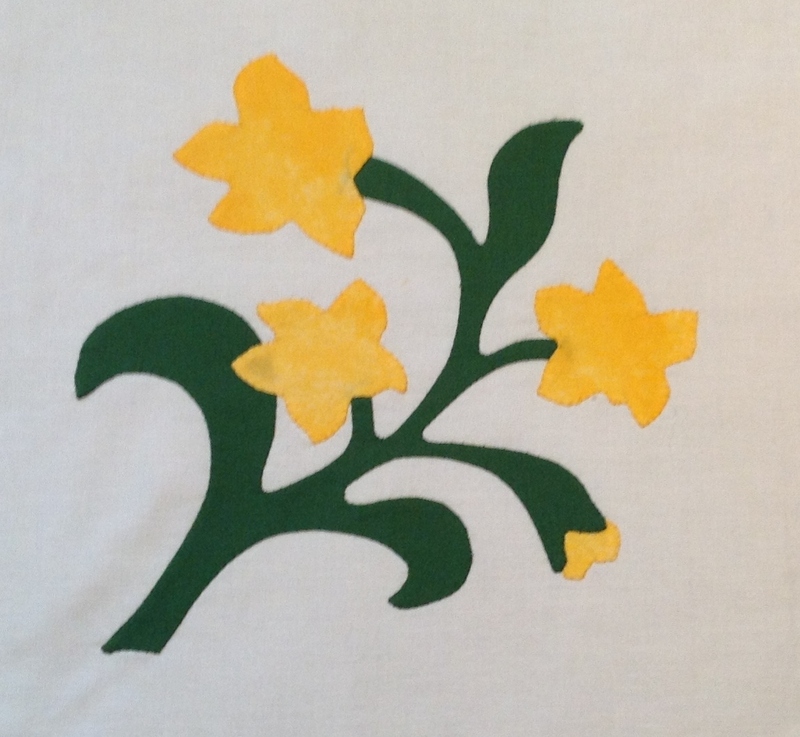 It has felt like a month since I did a post, but checking back, I am only 8 days behind my schedule – self-imposed of course – but enough to drive me to the brink of “oh no” another applique project!!!! 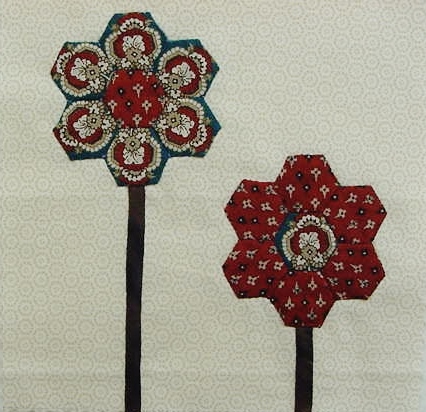 Earlier today I was reading a Blog and saw 2 of Karen Styles quilt patterns. I looked at Robin’s Nest and thought – “should I”, then a little birdie said – CHECK OUT THE PATTERN STASH – and there it was! Nestled in with Mrs Billings quilt pattern from Karen (heck I thought I had down away with Mrs Billings). 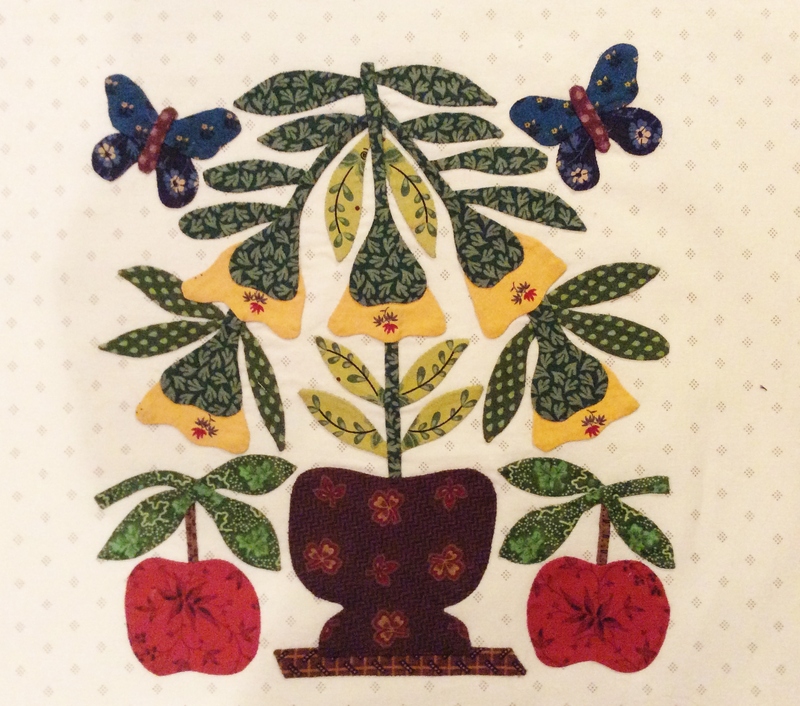 My friend Jan and I talked yesterday and she reminded me that after an “unplanned” absence from quilting that she was working on the Dear Mrs Billings quilt again! Darn – There is no way I can start the Mrs. until at least mid 2017. But Robin’s Nest is a striking pattern. Isn’t it beautiful? 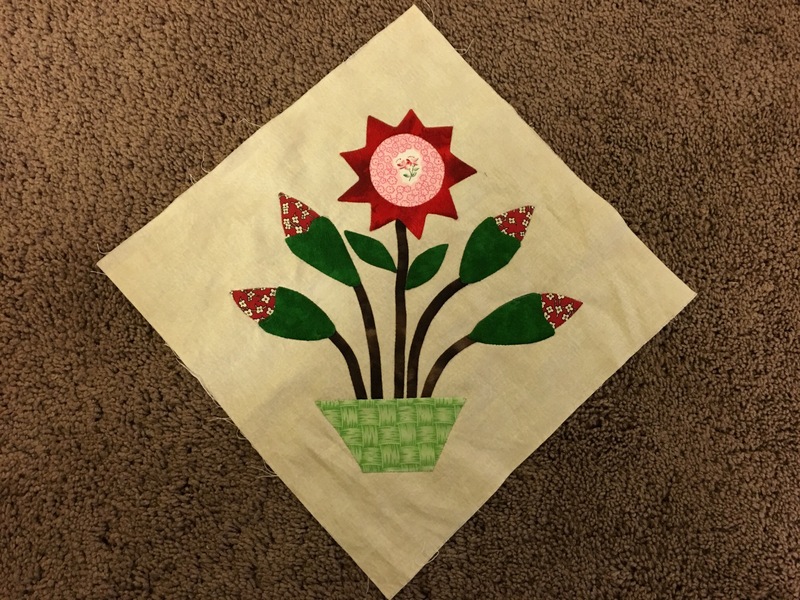 No, this is just a picture – I have not resorted to quilting 18 hours a day yet – need to talk with my hand doctor to see if he wants to add to his bank account! I will try to do this one next year also. (LOL) What a 71 year old dreamer I am today!! Well, here we go with Ms Margaret Potts! Jaydee and I are working on this one together. We figure – what the heck – one block a month for 7 years? We can do that easy peasy (as Jaydee would say) – a no stress project – finally!! 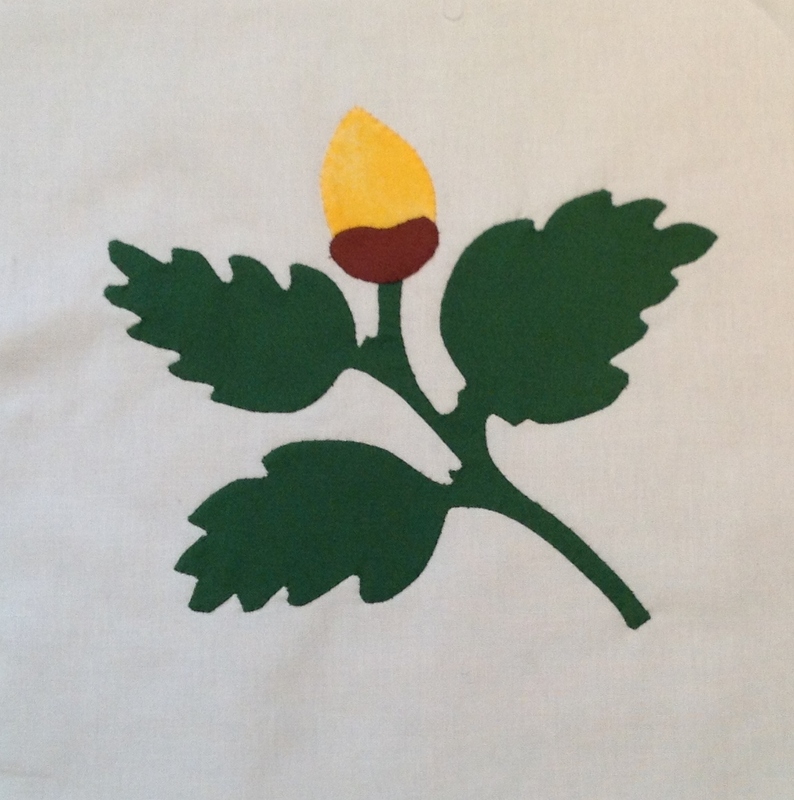 Anyone who is already a member of BAS is welcome to send me your pictures and each month I will post them on my Blog – if you are not a member of BAS and a dyed in the wool appliquer consider joining. 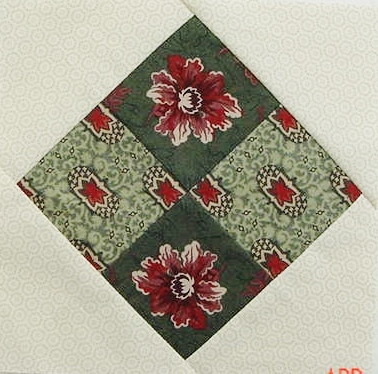 Each month BAS provides the pattern for the Potts BOM as a way to reach out to the “far away” members to join in the fun. I started using my 1930’s fabrics, but quickly decided I did not like the fabric for needle turn applique, so I switched to some Kona’s. They are not my favorite, although I know that they are best used in the Baltimore Style Reproduction quilts. I finally settled for “let’s play with the stash” choice and now I am using whatever strikes me. 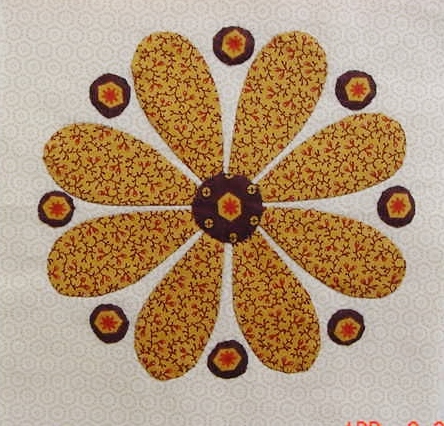 In the first 4 blocks I have used a batik and a lot of Moda’s. These are fun and easy blocks. 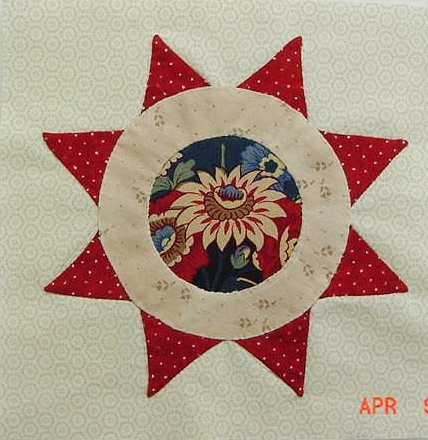 The finished size will be 8 or 8 1/2″ and the quilt is set On-Point. I took pictures on point – guess I should have done what Jaydee did, but now I am too lazy to retake the pictures today! 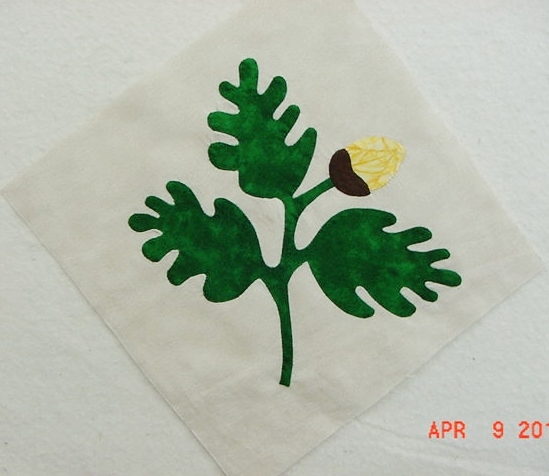 Potts Block 30 – The original leaves were too close together, so I re-drew them. 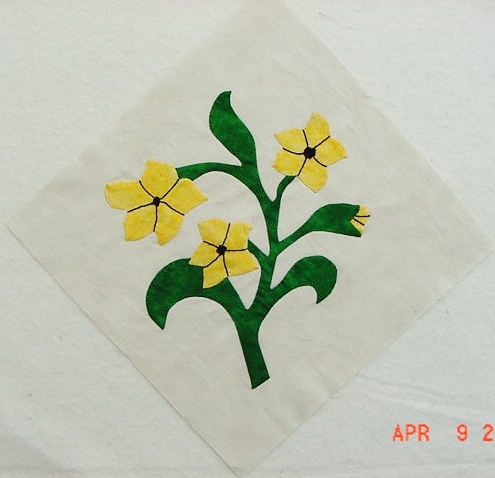 Potts Block 31 – I added French Knots in the Center and outlined the flowers. 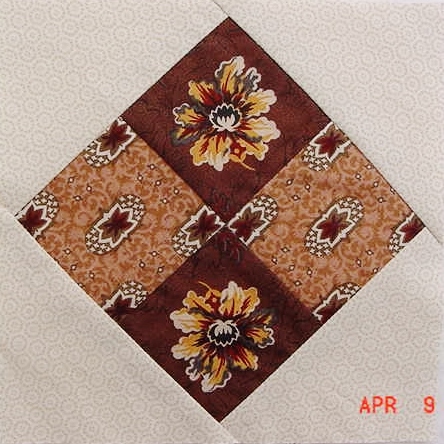 Potts Block 32 – I played with some fussy cutting on this one and did away with the basket handles! Well, now that WordPress and I have spent about 30 minutes trying to get these pictures downloaded, I have had all the fun I want for this posting! I will be posting the CWB BOM group progress and my Stonefield’s progress on another post. Have a great day!